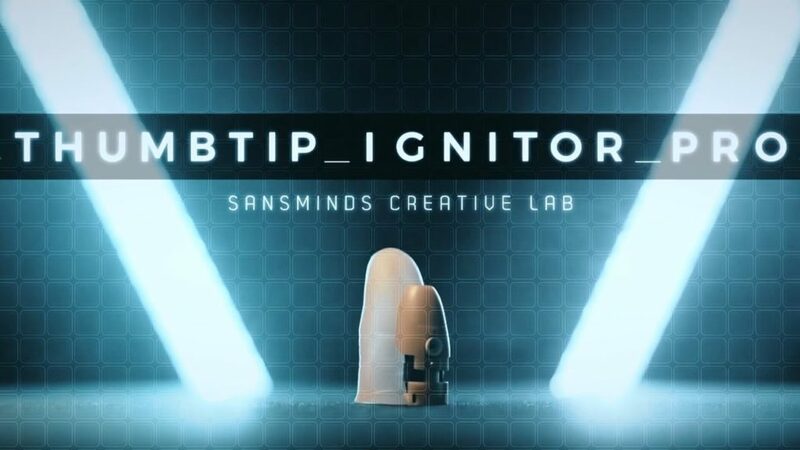 When I saw the promotional video for the SandsMinds Thumbtip Ignitor Pro I was all jazzed up. This is cool stuff. When I heard the SansMinds state “When the device is triggered it shoots a mini fireball out of the device” I was freaking out. The possibilities??!! Well, it is not as good as I though, for reasons explained below, but it is still pretty good. You get the “stuff” delivered in a very nicely designed white box with a magnetic close. The various pieces come lodged in pre-cut form fitted foam. The presentation is excellent and appropriate for a gimmick in the $99 price range.As stated above you get 2 thumb tips, one for now and one for later. SansMinds includes a replacement TT because after time the TT will get stained with smoke and burn marks. This can be stunted by cleaning the thumb tip after every use. The thumb tips are excellent quality and realistic looking. They are not your old school hard plastic TTs. They are soft and rubbery and very comfortable.The downloadable instructional video is 46 minutes long and is excellently produced. It is very detailed. In fact, I thought it was a bit too detailed perhaps because I was anxious to start using the TT, but didn’t want to skip the video. Herman presents various routines in studio and they are strong and very good. I wish they showed some liver performances with their usual screaming audiences because in this case the screaming would be legit.If you watch the promo video you will see the gadget and the thumb tip. There is not much hidden here. The gimmick is very cool, but I have to say that I was a bit disappointed because of the promo video statement that the TT shoots mini fireballs when the device is triggered. I find that language to be a bit misleading. I thought, and I think it is reasonable to do so, that you literally pressed a button and the TT would ignite the flashpaper that you are holding. I was wrong. You will need to have some flash cotton as well to use this and if I did not have any on hand when I received this product, I would have freaked out. So, if you are buying this, you should order some flash cotton with it. Otherwise you will feel like a kid on Christmas (or Hanukah) morning after receiving the best electronic present ever, but you can‘t use it because your parents didn’t get you the requisite batteries! I thought the TT itself would be able to ignite the flashpaper like Flashtray does. Because you need to load flash cotton into the TT before every use, it is sort of a buzz kill. It takes about 30 seconds to get and load the proper amount of flash cotton into the device and that means it is not practical for repeated performances. The amount of flash cotton used is a tiny amount. Resetting the TT requires you to disappear into a private space and perform some simple surgery. Another criticism is that the device does not stay in place like SansMinds suggests. This is not a huge deal, but it is a bit fiddly. They suggest that you can use double stick tape to make the device lodge and stay in place. I did not find that suggestion helpful.The device has a USB charger and does not require batteries, just a charge. This is a great function.The criticisms above would not deter me from buying this awesome device, but you should know what the downsides are. Nothing like being an educated consumer. I love the James Bond gimmick that helps you shock your spectators. Actually, you will be walking around your house scaring your family members because this is too good to wait for the perfect moment. Thanks to Murphy’s Magic for asking me to review this product which is available at any Murphy’s dealer.